This post brought to you by At Home. The content and opinions expressed below are my own. Do you have teenagers? I have 3 teenagers. The oldest two are girls (19 & 16). Yes, I just heard your slight gasp and for all you fellow southerners, a “blesser’ heart” too. 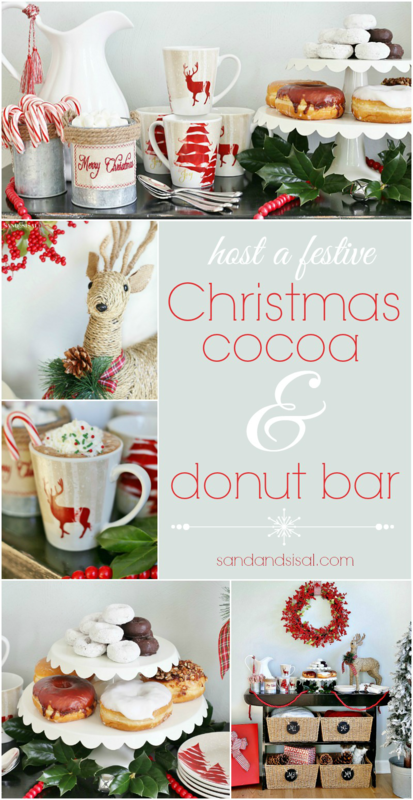 Keeping the Christmas magic alive throughout the teen years vs. the grade school years is a bit more challenging. This year I wanted to do something special for the girls. I gave them A Winter Wonderland Christmas Tree all of their own. My first stop for decorations at nice and low prices everyday is At Home Christmas Decor. They have 101 (yes, 101!!!) 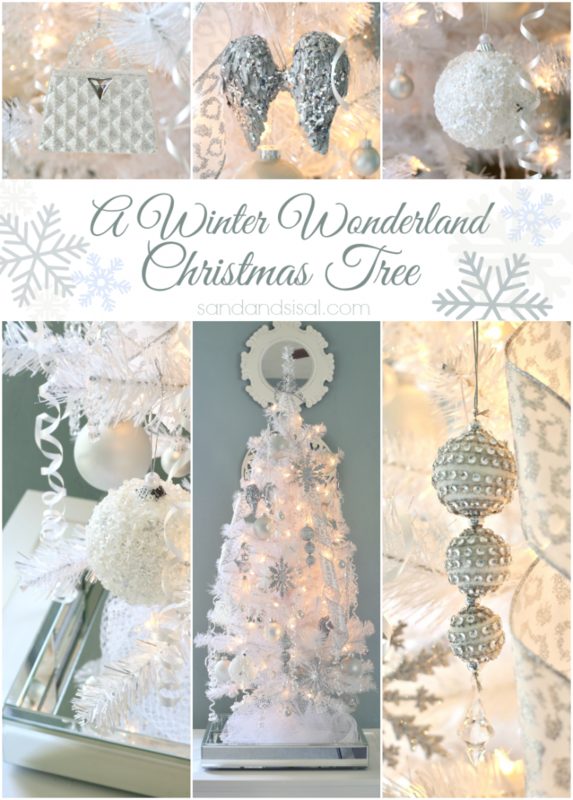 different varieties of Christmas Trees trees and a beautiful Tree for Me collection. I’ve always wanted a white Christmas tree. 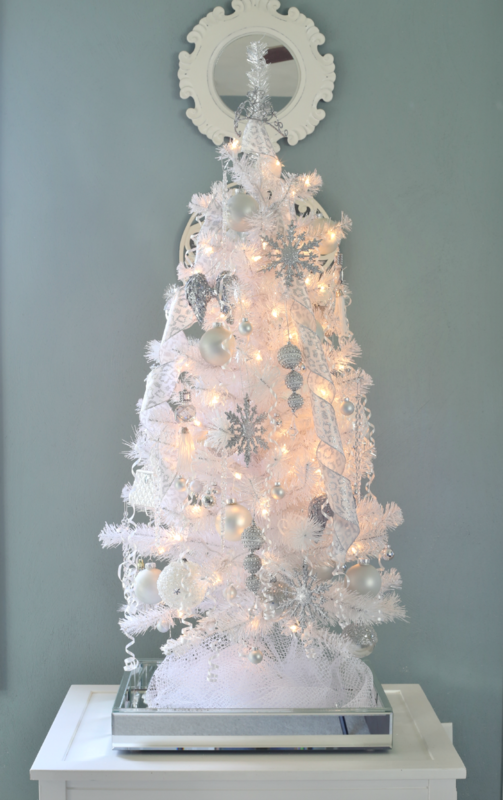 They have a gorgeous white flocked, full sized one, but this tree was going to be for the girls’ room so it needed to be smaller. 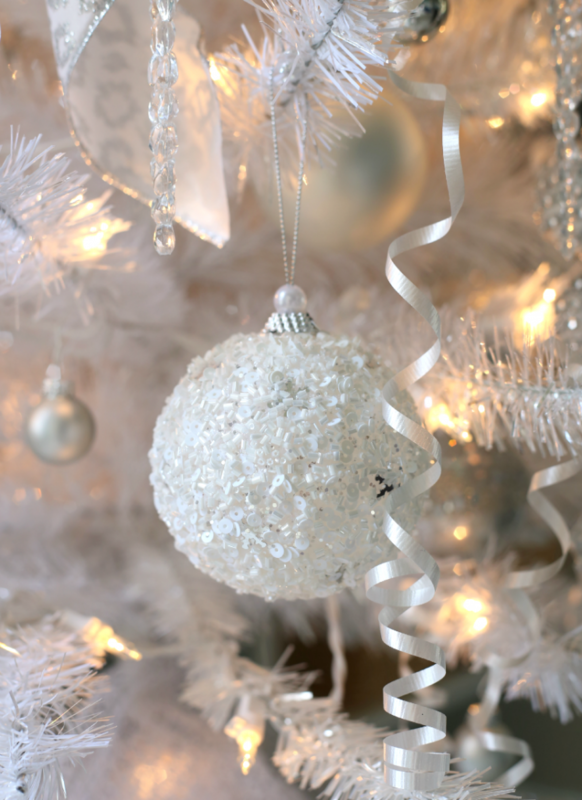 I found a shimmering white 4′ tree that would fit perfectly for them. The look I was going for was a winter wonderland. 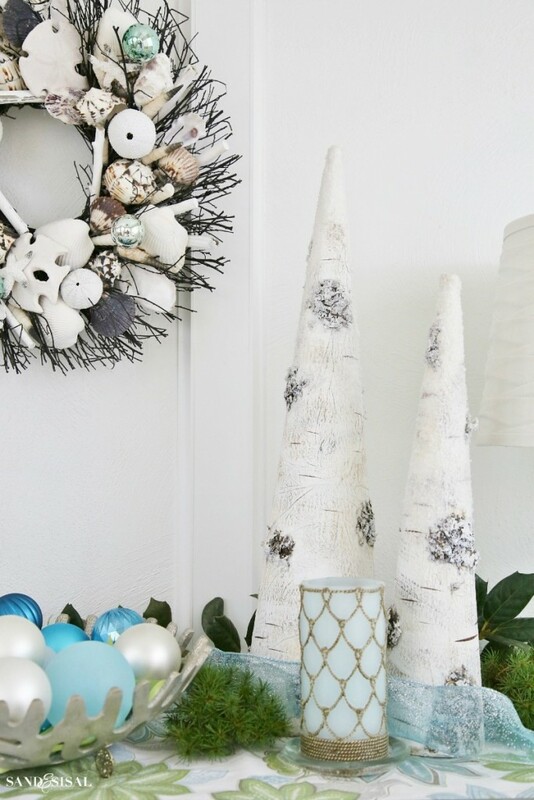 At Home has 15 different Christmas decor themes. 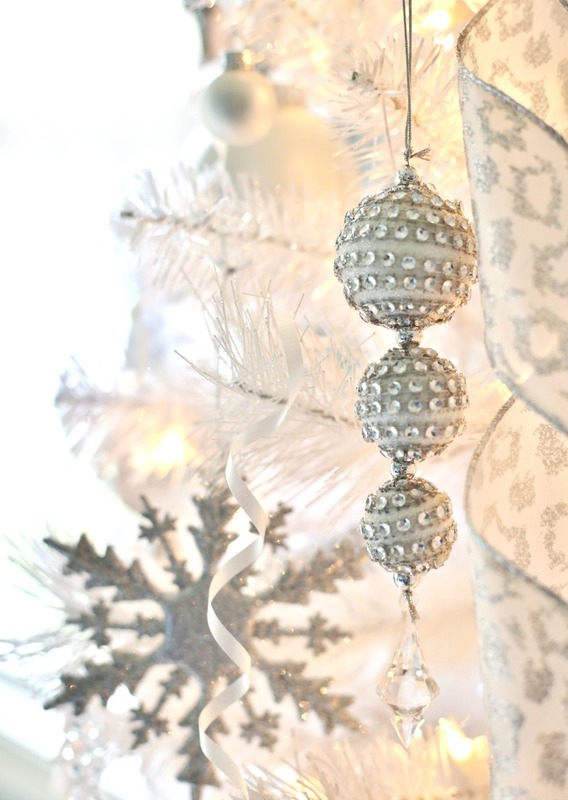 Tassels and rhinestones, glitter and glam can describe the frosty white Snowcapped Scene and Crystal Chateau decor lines I chose from. Diamonds are a girl’s best friend, right? 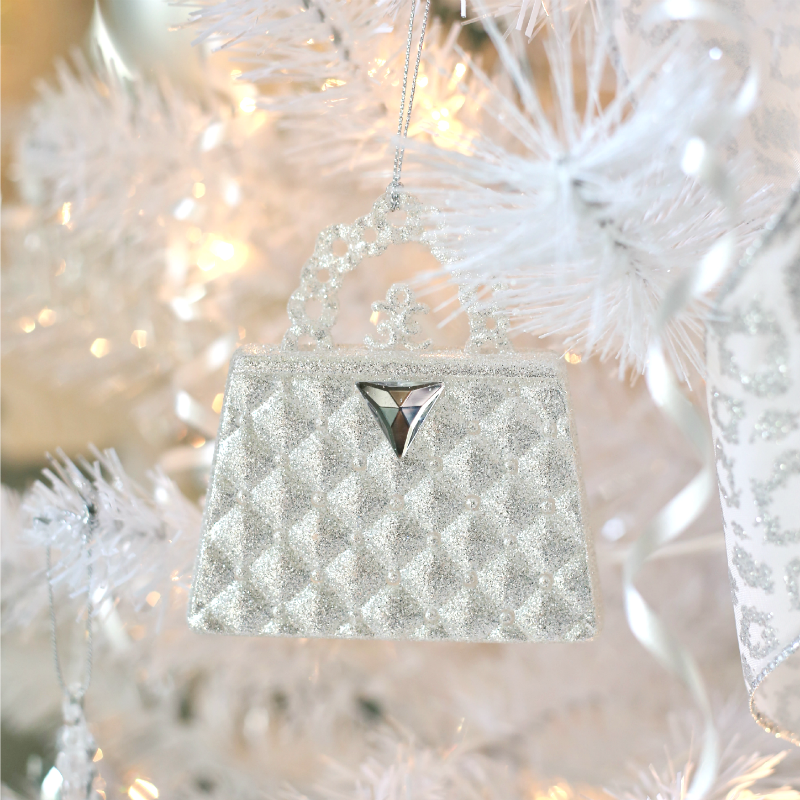 How adorable is this little sparkly purse ornament? 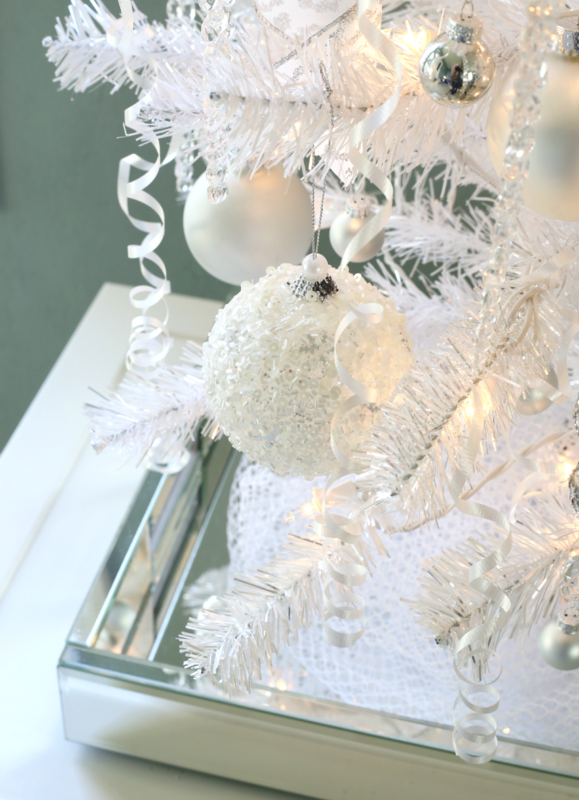 To add more sparkle and shine to the tree, I placed it on a mirrored tray. 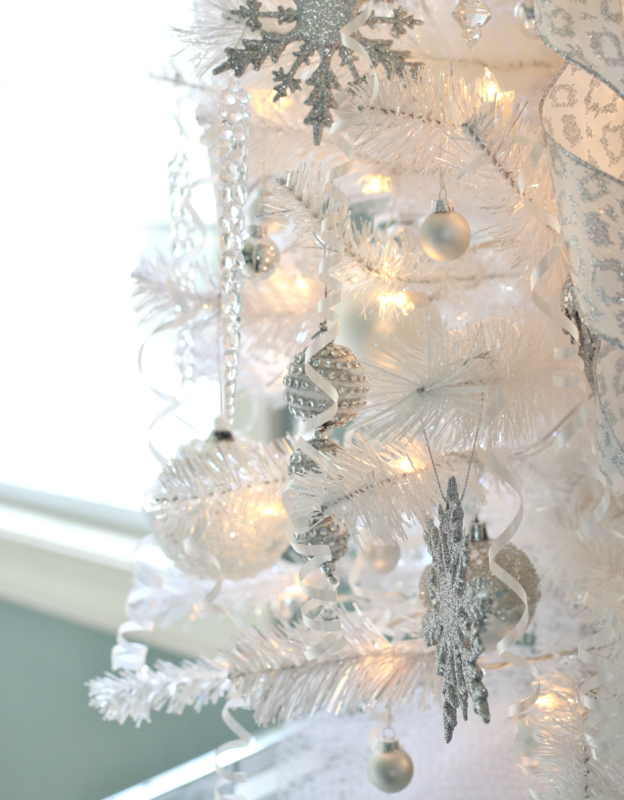 You won’t believe what I used as a tree skirt. It is a white mesh laundry bag I had in the linen closet! The “skirt” is light and airy and adds fabulous texture. White sequined snowball ornaments and non-breakable icicle ornaments give it a frosty touch. To add interest an filler, I curled inexpensive white curling ribbon with scissors and draped it all over. 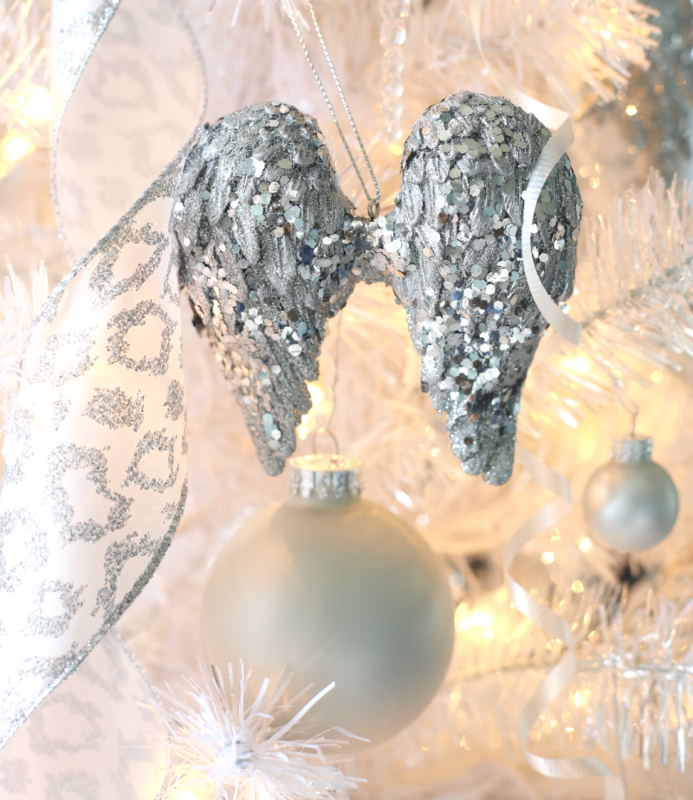 Silvery angel wings are little reminders to them to always stay angelic (wink). And to always be a light in the darkness. kim, super pretty tree. 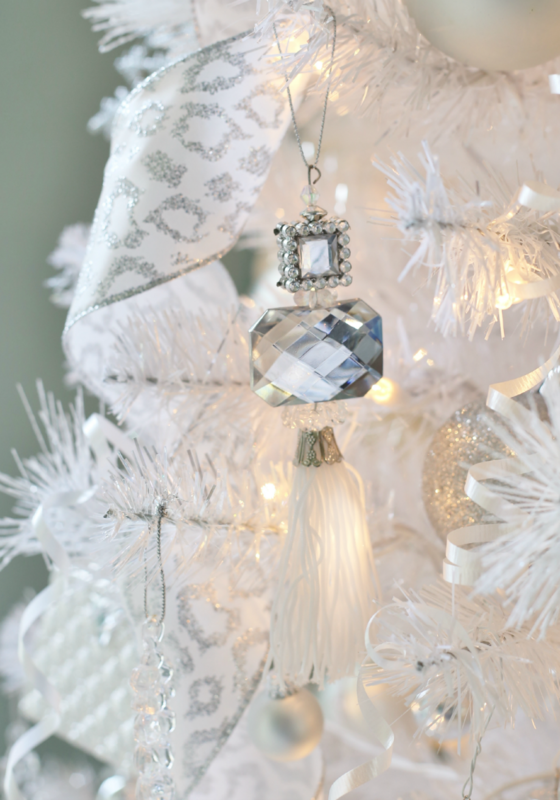 I love all the details, the bling, the sequins and the tree skirt! ha. i love that. have a great thanksgiving. Thank you Laura! Happy Thanksgiving to you too! My 15 year old is soooo into Christmas this year! She would love to have her own tree. I might have to do a small one like you did. Did the girls get to pick out any of the ornaments? Did they want to? Or were they happy to let you do it? 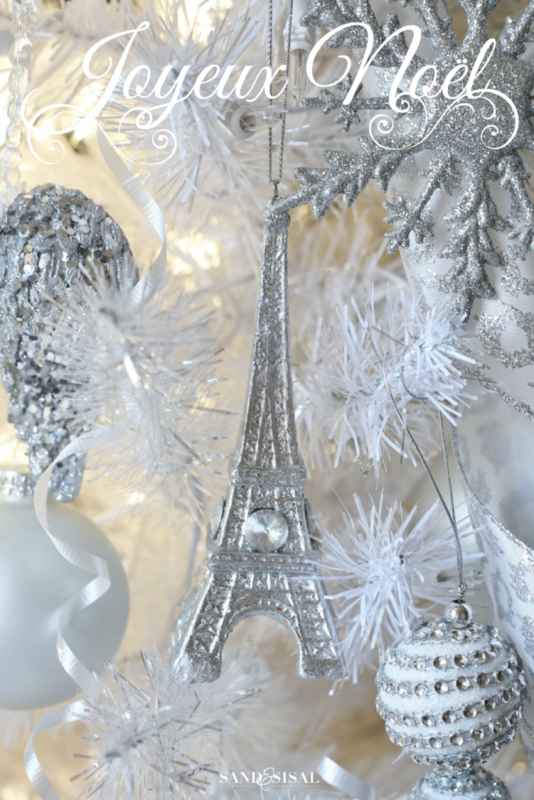 I love the white theme! You did a great job and the tree skirt is perfect! Thank you Sheila! I actually picked them out. They love them (thankfully!). It’s so much more glamorous in person! 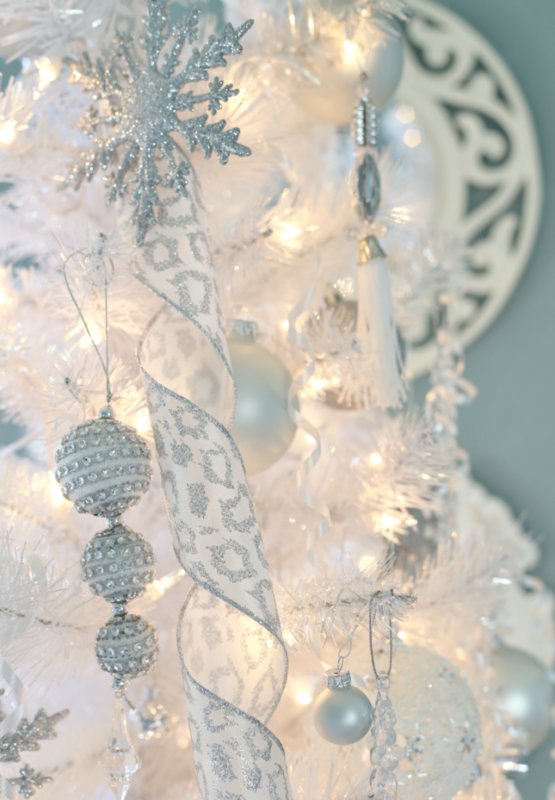 The tree was super inexpensive too! 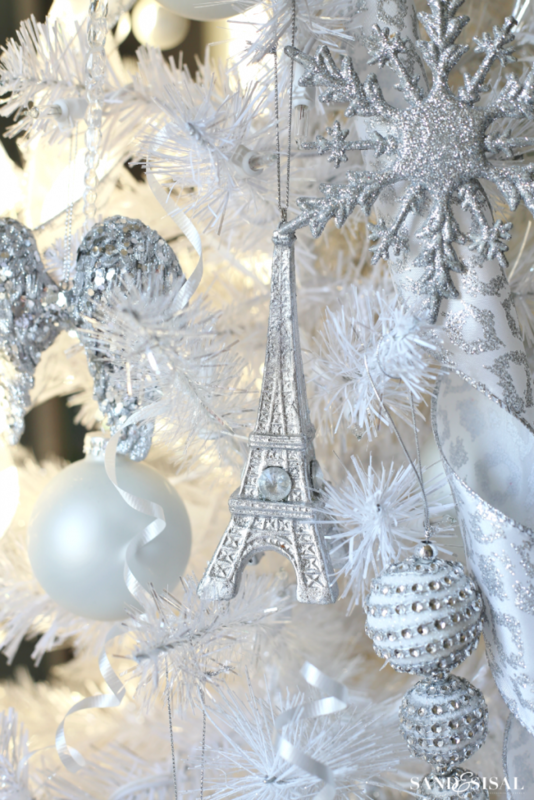 Oh my goodness what a beautiful tree!! I bet your girls love it!